On the morning they left Pahlgam there was a battle among the Sannyasis, which almost came to a bout with staves. One flag only is carried on the pilgrimage to Amarnath, and it entitles the standard-bearer to a third of the pilgrims' offerings. For years the privilege has fallen to the Shivaites of Bhairon Asthan in Srinagar, but the Mahunt of a rival temple, the shrine of Mahadeva on the Takht-i-Suleiman, claimed that his followers were more numerous. He had carried his banner far through sun and rain, and he swore by all the attributes of Siva he would not leave it behind. When he drove his little standard in the ground, the others protested with loud cries, and the two parties met in the streamlet which separated their camps, shouting and waving their staves. The magistrate of the pilgrims rode up on his ambling tat, and in the middle of hearing both sides declared in favour of the Bhairon Asthan party. It was the order of the Maharaja of Kashmir that they should carry the standard as before, and that there should be no other flag. "Under what provocation, then, has the cholera goddess scourged the camp in past years?" One of the others struck at him with his staff, but a bearded khaki-clad Mussulman of the Maharaja's police intercepted the blow and pushed the scowling Sannyasi aside. He threatened to go back. Thus a scourge would fall upon the pilgrims. "It will be ill for those who disobey the orders of the Maharaj Adhiraj," the magistrate said as he rode away. And the defeated Shivaites retired to their camp with sullen murmurs. The sun stood high over the valley between the cliffs, and the last of the Maharaja's camp-followers had filed by when they rose sulkily and followed in the track towards the snows. ~ On the edge of the World (1919) by Edmund Candler who visited Kashmir around 1913. 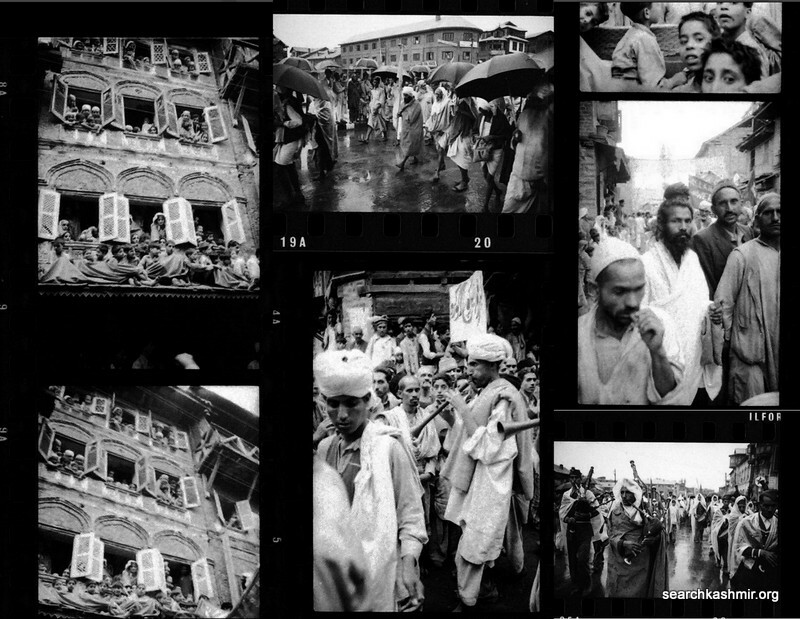 Scenes of Chaddi Procession in Srinagar captured by Brian Brake in 1957.